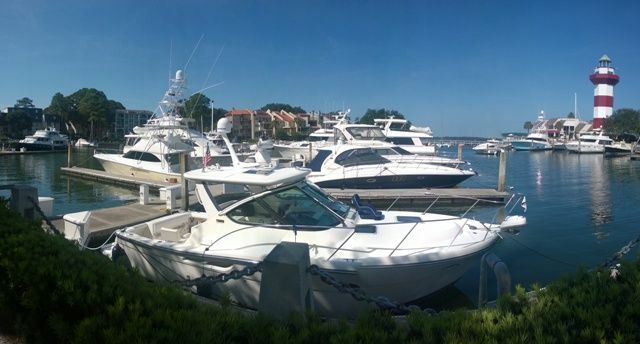 The Island's landmark Harbour Town lighthouse, is just a few blocks away, is surrounded by shops, eateries and the spectacular yachts in the marina, you will find our home to be bright and very comfortable with the ideal location. There are two bedrooms plus a pullout. Enjoy your morning coffee or tea or an afternoon beverage on the patio as you view the golfers on the No. 1 green of this PGA tournament golf course. Perhaps a swim suits you? Well you can be poolside with just a few steps from our home. If the beach is in your plans, you can ride your bike or drive your car to the Sea Pines Beach Club. And don't forget to stop by the South Beach Marina, home to the Salty Dog and many other shops and eateries. For bike rentals consider Riding Tigers who offer our guests a special weekly rate. We personally inspect our home a minimum of 2 times per year to ensure our guests that everything is in working order and the unit is in good condition. Deal directly with the owners of this property avoiding the addtional costs related to the services of a property manager. Down the road we hope to spend a lot more time using our home so we make a special effort to keep its condition at a level that we would require if we were there full time. Another benefit to our guests is the fact that there is no mortgage on the property so our overhead is extremely low and we can pass that benefit on in the form of lower weekly rates than someone with monthly mortgage payment they need to cover. We always offer our returning a discount off the current rates. 2.5. Tub & shower in the master bathroom, shower only in the 2nd bedroom. Sliding doors overlook the golf course. Privacy fences on both sides. Great view of No 1 hole on Harbour Town. Pool is just a few steps away from your unit. Beautiful home, perfect for families. Stayed with 2 small children for a week and enjoyed our time. This was the perfect place for us to stay. The location was perfect for bike rides (approx .5 mile to Harbour town, 1.5 to Sea Pines Beach Club, 3 miles to Salty Dog) Villa was clean, stocked w basic necessities and had good WiFi. Code access for easy come and go, owners were friendly and quick to respond to questions. Would rent from again! Don and Tish were wonderful to work with as we arranged our vacation for the first time as a family in Hilton Head. They were responsive to questions (same day or within 24 hours), provided helpful information about the island and local attractions and activities, and accommodated an earlier arrival than we had anticipated. Their home in Sea Pines was clean and stocked with more than we needed (i.e. kitchen dishes and utensils). Although we did not use them every day, the bike rental (with discount) was helpful as we enjoyed biking to the beach instead of driving or walking or just exploring the many trails. It was nice to be able to clean and tidy up and close up the place and not have any required housekeeping "to-do's" before we checked out like at other condos where we have stayed (not in Hilton Head). We have already highly recommend Don & Tish's Sea Pines home to friends and would come back again when time allows. Very clean bright unit The view of the 1st green is impressive Bright airy unit We would not hesitate to recommend or to rent again in the future. Don the owner is obliging and helpful. Great pool only steps from the Unit. We loved our stay here. Excellent location, very clean, enjoyed the condo. My family has three small children and the condo was perfect for our family. It was a 5 minute walk to harbor town and the park, a close bike ride to the petting zoo. Place was very clean and had an area in front where you could keep your bikes and other outside items in. The pool was across the street and was a very large pool with Wi-Fi. Great location and everything went very smoothly for us. Thanks Don. Great property. Nice location with a great view. We have stayed at this townhouse several times. The owners are very friendly and responsive. It is always spotless and has a fully equipped kitchen. Very comfortable living including nice beds. Beautiful view of the golf course located near the pool. Highly recommended. Early Bird booking discount available. Multiple week stay discount available. VISA processing of 3.75% per transaction if applicable.